a strawberry shortcake and her creepy clown friend. Adding in a tissue box cover. I am not sure what the following creation is but it is resplendent in it's glue-gun gone wrong adornment. Stuffed guy and his fish pal joining the party. Welcomed by the cork wreath. On my regular thrifting there was fabric, a quilt book How to Make an Amish Quilt and Olaf. I have begun collecting certain Ty Beanie Babies, ok, the ones I think might be collectible, some that I attach atop baby shower gifts, and some I just keep for myself. Another retro item I have added to my secondhand thrift shopping list is vinyl records. Of course, they have to be in good condition and something I would eventually like to listen to, like jazz from the 60s/70s. 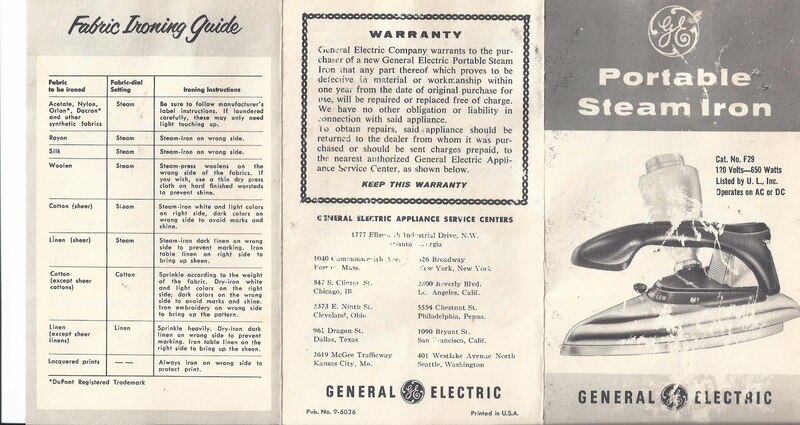 What is your Must Have collectible? The letter I have chosen to highlight this week is "P" for Pink Saturday hosted by Beverly at howsweetthesound. This is one of my ongoing features I revisit from time to time and third in the series of the aprilalternativechallenge. 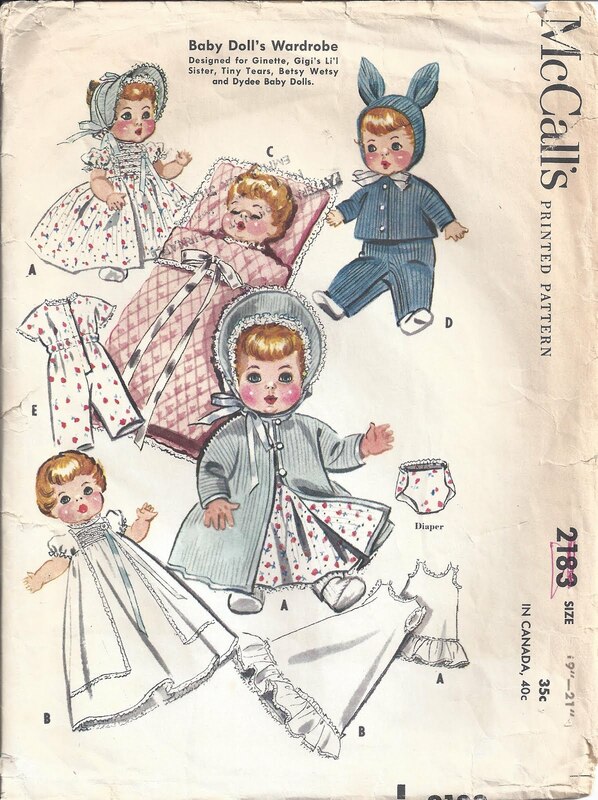 Leading off with a Pattern of the Day, a Baby Doll's Wardrobe from 1957. I scored that and five other doll clothes patterns from the 50s/60s at the Salvation Army Sacramento store. A slew of floral pinkness. 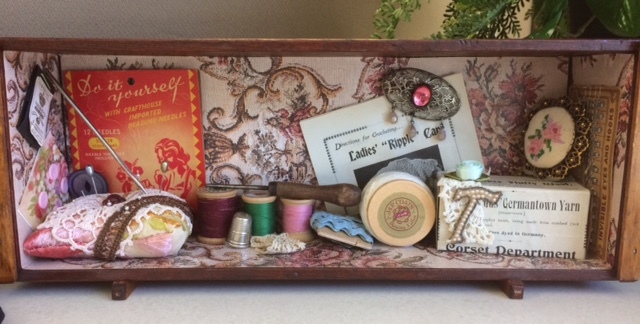 Well constructed needlework shadow box picked up at the Goodwill boutique thrift store ($6). I couldn't pass it up what with the letter "T" and all. I took the glass off the front for a clearer image. Pink remnants to be included in a quilt creation, dreaming of visiting Paris again one day. My go-to art spot at hospice thrift didn't leave me disappointed. The hibiscus flower needlework just needed a frame and the washed out butterfly framed print (half off) needed an update, (grand total $5.12). The frame was in excellent shape and there was no staining on the mattes. I hated to remove such a pretty backing but it was torn anyway. The needlework was protected in hard plastic so I removed that. I separated the mattes from the print and also removed the brackets on the back of the frame. I took the glass out of the frame and thoroughly washed it and rotated it to install the new piece. The green of the two mattes were so close, I just centered the picture and affixed the back with the bendable prongs. 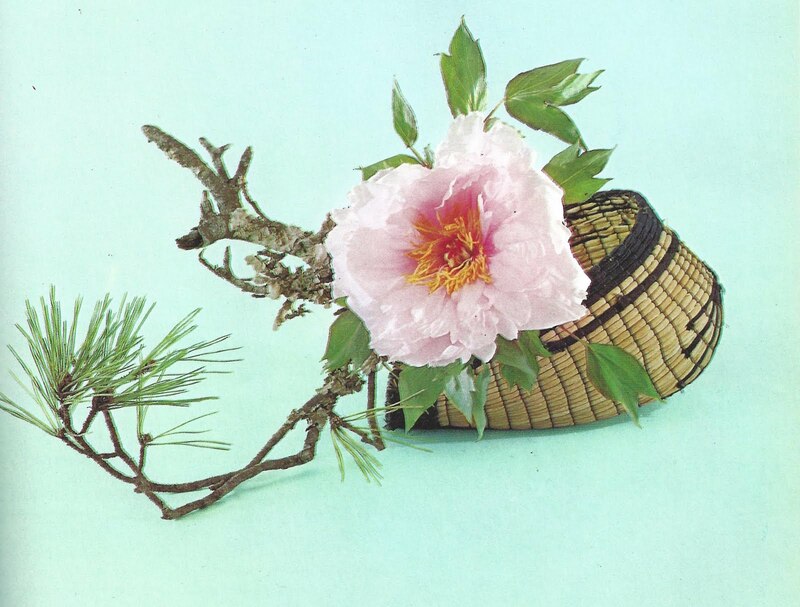 I love this new piece of artwork, it is perfect for spring! Have you found frames and pictures that were meant for each other? 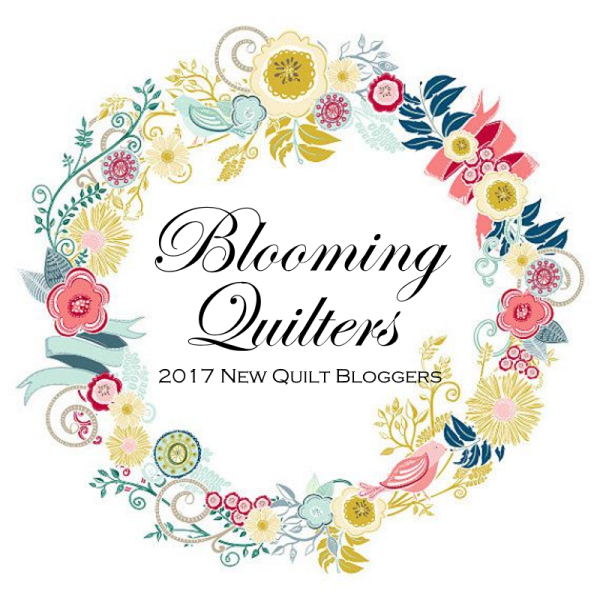 In other news, the 2017 New Quilters Blog Hop continues with the following participants in my "hive" posting on Monday, April 17th. I like to surround myself with beauty and art. One of the ways that I do that is to create quilted fabric wall hangings and covers to decorate my cubicle space at work. At my previous position, I had a partition that needed coverage here. This is about my process. I taught myself by books and YouTube tutorials how to make half square triangles (hst). The bear paw block has been one of my goals for over *coughs* forty years. This is the second in the series of my 4 posts for the aprilalternativechallenge. 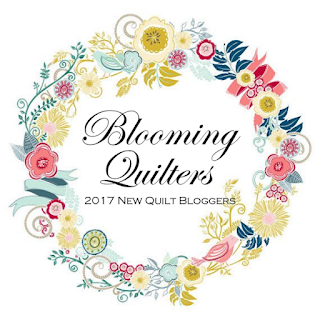 This is also my quasi-introductory post for the 2017 New Quilters Blog Hop. 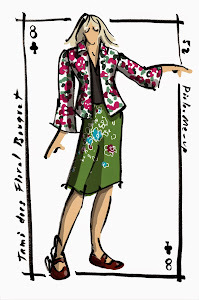 A bright floral charm pack along with a brown floral batik were the fabric inspiration for this project. The block at the top of the image was my first attempt at a bear paw, I had the wrong section in the wrong place (and have since corrected it). The second block isn't totally on point, it will be saved in remnants. The third and fourth blocks were spot on. What did your momma tell you about keeping to that 1/4" rule? I corrected my errors on this creation. On previous projects when blocks or pieces would misalign, I would just cover the mistake with applique. Because I want to produce a competition quality quilt someday, I engaged in ISR (irritated seam ripping), rather than ASR (angry seam ripping) and fixed my mistakes. My blocks now completed, I combined fabric until I was satisfied with the combination. This piece had to be no bigger than 17"x56" to fit into the space I had measured. I whip stitched salvaged pieces of cotton batting together. The detail shot shows free motion quilting of the meandering aka stippling stitch with a variegated brown thread. I am not happy with the thread. At first, I thought it was me and my inexperience but when I came to a juncture where the fabric was the thickest, the thread would jump. Once committed to this thread, I wanted to finish the project, thankfully a small one. One thing I have discovered with photography and quilting is I see my mistakes clearer when I am looking at an image than when I look at the actual piece. Must be my ADD or something, after I had put the quilt sandwich together, there it was missing a yellow border. I have done that more than once, missed a border or cornerstone. I had hoped to finish this project by post date, I am keeping to my 4 post challenge. I have once again chosen detailed free motion quilting stitches. I used a can of tomato paste to mark my big circles and then with my trusty quilt pencil, I drew the additional circles. I will update this post with the finished creation. 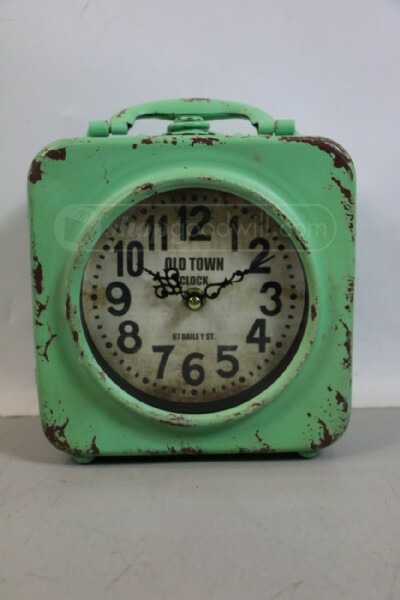 To go with my cubicle cover, I splurged on a retro green clock from my favorite secondhand online retailer. Can't call myself Thrift Shop Commando if I don't detail my finds! The Mr. has lost a bit of weight so I snagged a couple of men's Stafford brand lounge pants at $1.50 a piece. The $1 bag of remnants and BH&G 1978 publication Needlepoint were part of my $6 total. Sally Stand-In is showing off my $6 Charter Club find earlier in the week from Salvation Army and $4 jewelry purchase at another weekend thrift shop. When I saw the necklace, I knew it would go perfect with the summer dress print. The 2017 New Quilters Blog Hop begins April 10th. I am in the Blooming Quilter’s group under the direction of Yvonne @Quilting Jetgirl. Members of the "hive" are listed below. Look for upcoming posts this month and next and linkbacks to this amazing group! 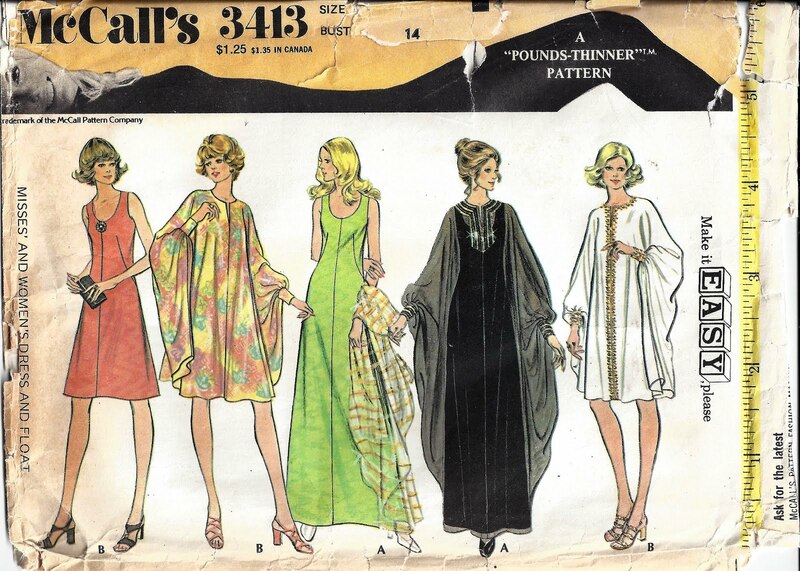 Ending the post with a Pattern of the Day from 1972, part of my weekend thrifting lot. Do you create anything special for your workspace? My first post in this 4-post April Alternative Challenge is an "A" letter day focusing on aprons and thrifting. 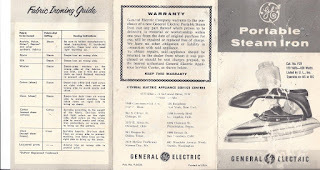 Last year, I participated in another April challenge where one of my posts focused on aprons-and-advertising-tins. This year's apron is a black and white one that I purchased thrift in the past couple of months. Cesar Chavez day off, a state holiday here in California, meant a visit to one of my up country thrift shops known to me to be a great source for fabric remnants. I was not disappointed, in fact it was a fabricpalooza! Ermahgerd. 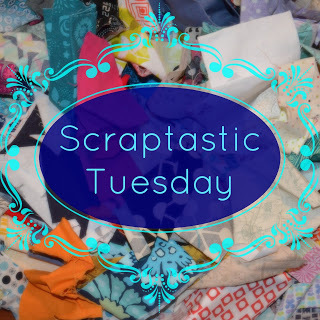 While I love receiving those mystery fabric collections that I purchase from online auctions, being able to pick and choose the remnants helps flesh out my stash. Fabric and clothing totaled $30 but a half-off frequent buyer card brought the total to $15. Sally Stand-In is wearing the Coldwater creek knit top and White Stag maxi skirt (along with my Pebbles & Bam Bam pearls) as part of the lot. What delights me most when I have a successful day of thrifting is outfits, like the one pictured above, that come together in a magical sort of way. 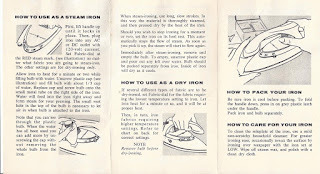 I am hard on irons, I drop them or they fall off of the ironing board. When I saw this retro gem, sturdy cord, wonderful hand grip and low center of gravity, I shelled out a whopping $3 for her. 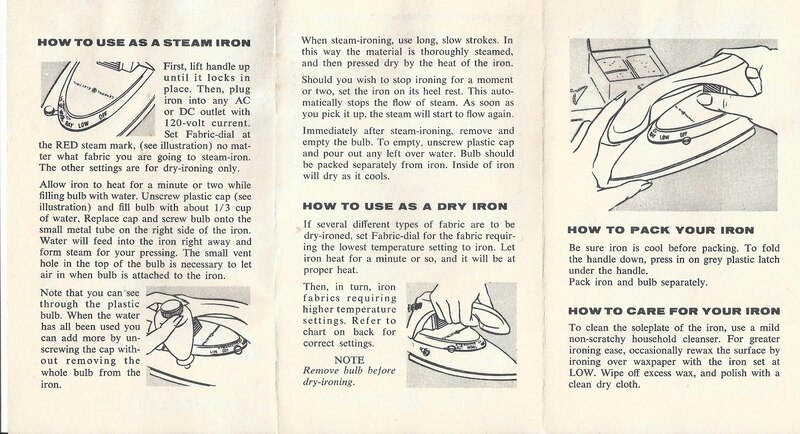 I have been delighted with this old-fashioned iron. I don't use steam so the intact steam part will remain unused. A spring-inspired fabric wall hanging/table runner will be featured in an upcoming post. There is still time to join the aprilalternativechallenge, a blog and Instagram challenge I am hosting in April. Any and all linkups are welcome.